Australians rejoice as we are graced with a limited edition package available only in Australia but the real question is, is it worth it? 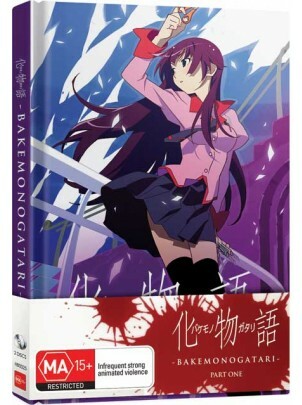 Bakemonogatari (that's a mouthful to say) is a show about an ex-vampire named Koyomi Araragi who saves a girl named Hitagi Senjogahara from one of the tallest staircases I have ever seen and becomes very curios about her as when he caught her she was lighter than a feather. Koyomi then starts to find information about her but she bursts in and threatens to kill him and then leaves. 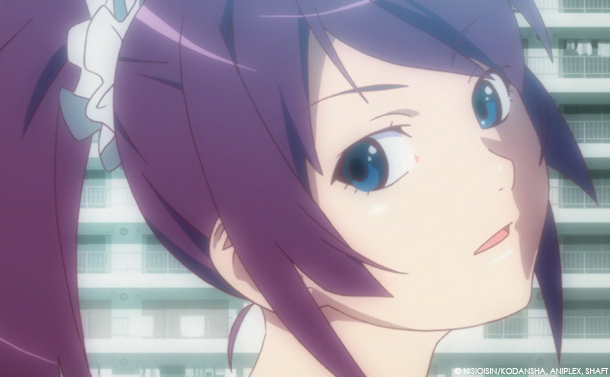 Koyomi starts to follow her and then gets brutally attacked by Hitagi and her seemingly infinite amount of stationary supplies. After this battle we find out why she felt light as a feather and it is due to being cursed by an evil crab god. 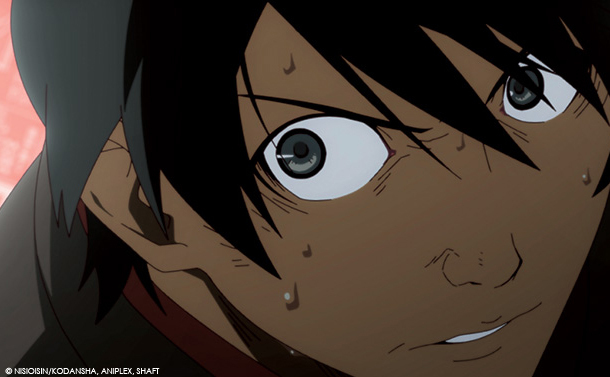 Koyomi decides to help her get rid of the curse by taking her to the same guy that helped him cure his vampirism. This won't be the only time you will see him as this series has a bunch of cases like this. (To see full article please click "Read More"). Each story arc/case is fairly short only taking up two to three episodes giving it the same feeling as reading a comic book series rather than watching a big epic saga. 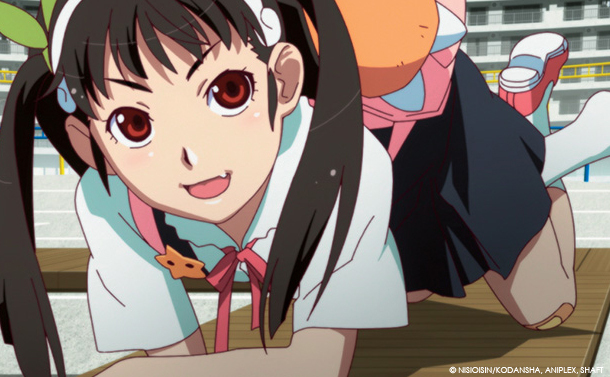 This show is quite difficult to nail it down to one single genre as there is so much genre clashing but also feeling so unique that it creates it's own genre that for now I'm calling "New Wave" and "Alternative Anime". Normally a show like this would feel very frustrating and pretentious that only hipsters would enjoy but this has none of that and comes off as a very well told story that is very pleasant to watch. The show is also very psychedelic although nothing as mind breaking as anything that Gainax (Neon Genesis Evengellion, FLCL) does but I can see it warding off people (their loss). One of the best parts of the show is the characters as they are just so charming, fresh, and original that you will instantly fall in love with them. Art-style is really great and very clean with some nice surprises along the way. Animation is really good for what they have but most of the time it's just standing and talking but when something else happens like a fight scene or a horror scene it's really well animated. Soundtrack has some songs that are annoying but the show mostly has some pretty good music and catchy to boot. Japanese dub was pretty good and matched up with all the characters really well so there isn't anything bad to say here. Special features are pretty decent with audio commentaries from the Japanese cast on every episode, a lot of text-less credit sequences that were pretty nice to watch, promotional trailers, and the packaging itself is what I would consider a special feature. Packaging is really amazing in this set as it's a hardcover art-book with some really nice art pieces of the characters and also has some nice bios on the characters also. Please be aware that the discs themselves come slipped into the last two pages of the book which I can see some people getting a bit disgruntled with but other than that it is very top notch. Overall don't let it's hipster-esk outta shell scare you as deep inside it is all sweet gooey caramel on the inside... and I love caramel. I recommend watching this one.